Solving Mill is a promising type of computer product, a communicator software that is ready to help you solve non-trivial problems in engineering, advertizing, management and other areas of human activities. It is based on the multiyear experience in TRIZ consulting for SAMSUNG and POSCO. It is designed for the support of non-trivial technical problem solving starting from the problem situation analysis to checking the efficiency of the obtained solution. The problems may relate to product development, production, storage, transportation and sale processes as well as to organizational management of an enterprise, advertising, etc. Non-trivial problems defy solution by traditional methods, so there is a need for a solution lying beyond the solver's experience and professional competence (so-called inventive problems). It is designed for manufacturing engineers, design engineers, project managers, specialists of innovation units of companies, etc. For all those who face the challenge of solving non-trivial problems. It may be used for training technical students. Because not all problems can be solved by traditional methods. Some problems require break-through thinking, but not all people are capable of such thinking. Solving Mill helps them reach their full potential of a solver. 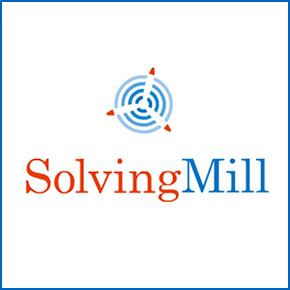 In Solving Mill, a solver is offered a step-by-step algorithm of work on a problem, tools for performing each step and sets of questions for a deeper insight into the problem situation and for problem solving. The algorithm and the tools are universal for problems from any field of industry and can be used in other fields of activity where such non-trivial problems may occur. What does the user derive from the work with? Upon completion of the work, the user has: a solved problem, a recorded process of working on a problem in the form of well-structured texts, drawings, diagrams (i.e. a finished report on a project), a draft of a patent claim which can be compiled based on the report data.